In the Hockey East title game, the #4 Terriers jumped out to an early 2-0 and never trailed, en route to a 5-2 win over Northeastern at Hyannis, Mass. 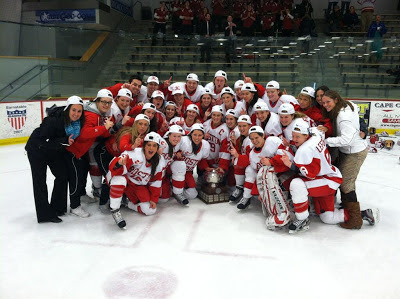 The victory gave BU its third Hockey East title in the past four seasons and earned the Terriers home ice in the quarterfinals of the NCAA tournament, which begins next Saturday, March 16. BU will host #5-ranked Clarkson in a 3 p.m. start at Walter Brown Arena. After Isabel Menard and Sarah Lefort gave BU the lead after the first period, Northeastern cut the margin in half just 2:22 into the second. But senior Jennelle Kohanchuk got it right back fifteen seconds later, scoring her 21st of the season. Goalie Kerrin Sperry (photo), who made 35 saves and stopped 93 of 96 shots in the tournament, earned MVP honors and improved her record to 22-4-3 with a 2.11 GAA and a .921 save percentage. She was joined on the all-tournament team by co-captain Marie-Philip Poulin, Shannon Doyle and Louise Warren. Menard (2-11-13) broke the the career tournament scoring record previously held by last year's BU captain, Jenn Wakefield, who had 12. 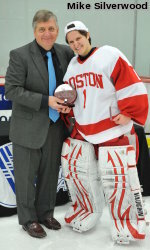 BU has now won six consecutive Hockey East tournament games and nine of its past ten. The Terriers, whose program is in its eighth season, previously won titles in 2010 and 2012.